So very happy - see a whole new glittery world, colors are so bright, everything's coming up roses! Now young eyes - what a gift from a master-worker of a surgeon! Dr. Doan a great doctor. Would recommend. Very good result and a pleasant experience with doctor and staff. All are very professional. 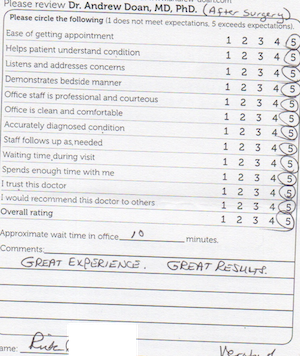 Very pleased with treatment, and staff is very professional. All around a very professional and great doctor. The waits are only problem. A little too long. Both Dr. Doan and Amy are one of a kind the best always professional and courteous make me feel at home. I am a happy person being able to see Dr. Doan. He's such a nice person and I feel he is an excellent Doctor. As long as he's in my insurance plan, I won't see other Doctors. Wait time: 10 minutes or less. Dr. Doan is very professional. I trust his diagnoses. Dr. Doan put my concerns to rest before, during and after. He and his medical staff were most pleasant and professional. He surpassed even my highest expectations. He's a real 10 out of 10. Very happy to have found Dr. Doan, I was going as second check. Well done, keep up the good work. IT HAS BEEN A GREAT EXPERIENCE COMING TO EYE ASSOCIATES. I AM VERY PLEASED WITH THE OUTCOME OF MY CATARACT SURGERY WITH DR. DOAN. EVERYTHING TURNED OUT VERY WELL. ANTICIPATING SURGERY ON OTHER EYE. PROFESSIONALISM "A+". THANK YOU! Amazing outcome to surgery. Go into surgery with poor vision, immediately came out with clear vision. No pain or discomfort whatsoever! Very nice, polite. Thank you doc!!! I thank God for Dr. Doan! I thank God for Dr. Doan. A doctor that really gives you all the time you need to ask questions and to discuss all your eye needs. My cataract surgery a complete success! Finest surgeon I have met. Makes me look forward to office visits. My mom received excellent care.